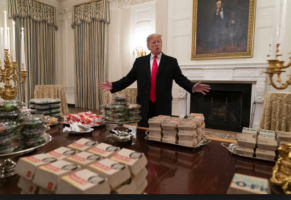 After weeks of top-secret backroom deals, political kickbacks, and hundreds of dollars of spending, Donald Trump has finally collected every single last McDonald’s Happy Meal “Monster Truck” toy before their removal from the market. The President announced this achievement to the slightly confused nation in place of the traditional “State of the Union” address. The jubilant speech was delivered on the White House lawn directly in front of a large banner with “Mission Accomplished” written in big letters. “I got them all, folks,” the actual president said to raucous cheers from his unpaid Secret Service guards. “I got the one that looks like a shark, the one that’s like a dog with his tongue hanging out, and the one that looks like a lizard but it’s blue, and it actually looks like a truck, so I guess it doesn’t really look like a lizard. We did it America! And by we, I mean I.” Then, to the chants of furloughed governmental employees, he force-fed the Clemson Football team chicken McNuggets. Unfortunately for Donald, his toy collecting days may be over soon, as someone accidently built a wall around the white house.